There are three things which can irrevocably change a man’s life – the death of a loved one, a moment of revelation and saying the wrong thing at precisely the wrong time. Unfortunately for Professor Henry Tomlinson, he has recently experienced all three. And it’s those experiences which threaten to push him over the edge. Is his past really key to understanding his present, or is it yet another trick of his mind? ‘Existence Is Futile’, the debut novel from Scott Andrews, tells the story of one man’s struggle to keep his head whilst he tries to come to terms with his own reality. 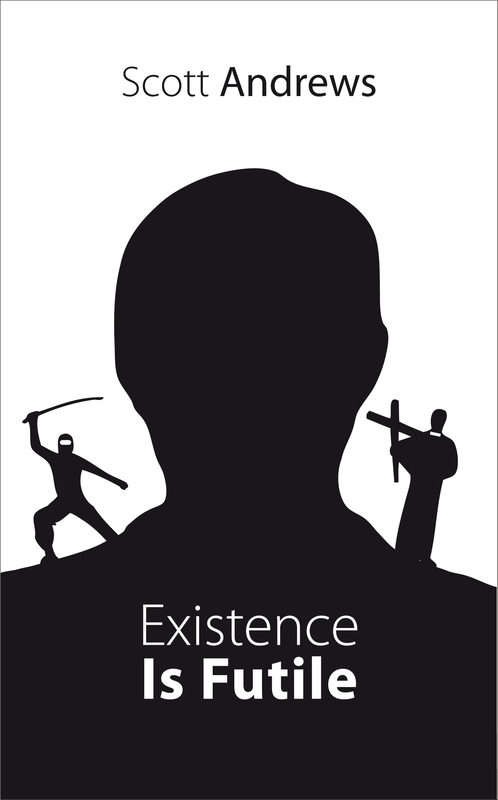 ‘Existence Is Futile’ aspires to address a number of existential questions, is brave enough to attempt jokes which don’t include toilets and inclusive enough to include a ninja. That’s right. A ninja. ‘Existence is Futile‘ is a brave, honest, sometimes confusing, but ultimately very satisfying novel for those who expect more from literature than just entertainment. It is demanding. It is critical. But, it has a big, pulsing heart. Wonderful. Andrews leaves the reader with an ending that was a surprise to me, but lovely. Excellent read! This is… a hard book to describe. I’ve read it, and I’m still not entirely sure what it is about. The process of loss? The questioning of sanity and reality? The futility of humans? Or about actual ninjas? All I know is it was fantastic. Although all the above sound quite intense, Andrews has given us a book that is full of warmth and humour; it is easy and a delight to read, without dumbing down on its topics.